The Foundress, Mother Mary Aloysia A.C. Mother Mary Aloysia of the Sacred Heart, the Second Superior General of the Apostolic Carmel Congregation is proclaimed as a woman of faith, and of far-sighted vision for development and progress. Mother Aloysia was essentially a self-made woman. Very few were the facilities for education during her time. She possessed a marvelous intuitive genius for educating herself and others. She encouraged the old and the young to do all they could to gain knowledge stressing that intellectual and spiritual progress were closely connected. She ever had her fingers on the pulse of the times and marched onwards, requiring the same of her staff. Her greatest contribution to Women’s Education rests in the founding of St. Agnes College in 1921. The burning torch of higher education held aloft and handed on by St. Agnes College has its source and origin in the philosophy and teaching of its Foundress Mother Aloysia. Mother Aloysia a farsighted visionary, a great missionary and a brilliant luminary is etched forever in the hearts of the Mangalorean community and through them into the whole world. As a visionary, she laid a firm foundation for women’s education from the Lower Primary School to the High School and then the Teachers’ Training School and finally reached the zenith of higher education for women. Mother Aloysia forged a philosophy of education in the furnace of service as headmistress of schools. Education as she understood it “was a means to help a person to save one’s soul through the fulfillment of one’s duty to one’s God, to ones neighbor and one self.” The girls under her care were given a very strong religious, social and intellectual formation. 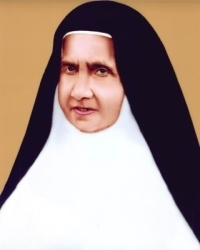 Mother Aloysia with her wide vision and deep apostolic spirit saw the need for opening a school for girls in Bendore, which was then the suburban area of Mangalore and also an underdeveloped remote area. After five years of assiduous search and negotiations for some 20 different sites a plot of ‘Hulli Mulli’, an arid land belonging to 16 proprietors in clustered huts and cottages was bought. A land with a few fruit trees and palm groves growing amidst the wild shrubs, bushes, unsanitary wells, flowing water, dry leaves and grass all over was eventually transformed into a productive piece of land to cultivate the spirit of learning. Mother Aloysia chose St. Agnes as the Patron saint so that the young saint’s heroic life of the highest values might serve as a source of inspiration and a model for thousands of young girls who would grow under her protection. The motto, “GOD IS OUR STRENGTH” is the source of inspiration to all the institutions on the campus. With her foresight she realized that girls from their sheltered homes would hardly dare to go as far as Madras, Mother Aloysia envisioned higher education for girls. Despite difficulties, contradictory advices and sometimes seemingly impossible barriers the first women’s Catholic College became a reality and was prayerfully dedicated on 2 July 1921. St. Agnes, a First Grade College was the only one for women in South India and the first in the whole of India to be managed by an Indian Private Management. It was indeed a blessing to all young women of South India to pursue their higher education in their own native place. This was the crowning achievement of her life work, which stands as a monument to this day. The sapling that was planted in 1921 with nine students in Humanities is now branched into different streams such as B.A., B.Sc., B.Com., BBM, BCA & BSW and at the PG Course, M.Sc. Psychology, M.Sc. in Clinical Psychology, M.A. in English, M.Com., M.Sc. Chemistry. For the past ninety-four years, thirteen principals have shouldered the responsibility and continued the legacy handed over by the foundress Mother Aloysia. Mother Aloysia was indeed a true missionary. During her tenure as superior general she opened several convents and Schools in India: Stella Maris Convent, Kotekar, St. Cecily’s Convent and School, Udupi, Lady Hill Convent and School, Mangaluru, Mount Carmel Convent and School, Ahmedabad, and Providence Secondary School, Calicut. Mother Aloysia, a pioneer in education now decided to take the Congregation beyond the shores of the country, crossing seas and oceans to be the first missionary into the unknown land. Great was her zeal for faith formation which urged her to set foot in Ceylon. Mother Aloysia was endowed with a unique personality, a combination of rare external gifts of nature and the still rare gifts of inner sanctity. She was elected as Superior General for three consecutive terms for 18 years. In the year 1918 she wrote the Constitutions of the Apostolic Carmel Congregation and received “The Decree of Praise” and Approval of the Constitutions from Rome in the year 1926. Her contribution in the field of women’s education was recognized by the then British Government of India and was awarded the Kaiser-i-Hind Gold Medal of the I Class, in the year 1929. She was the first woman recipient of such a prestigious National award. “Put yourself to attempt the highest, the best. Your initiative will spur others to follow suit” said Mother Aloysia. She was the spur, the moving spirit of the apostolic Carmel for well-nigh 66 years. An enduring faith in the Lord’s ways, a deep loyalty and service to the society, dedication to the great work of education is the rich legacy she has handed down to the Apostolic Carmel Congregation. She thus stands out as a woman we shall always remember with love and gratitude. The vision and mission of Mother Aloysia is lived even today by the sisters of the Apostolic Carmel and shared with the staff, students, parents and society at large through education and other Apostolic works. The motto of St. Agnes “God is our Strength” continues to flow into the life of every person who enters the portals of St Agnes. St Agnes College continues to serves as a home of faith, a home of fellowship and a home of fruitful study giving life and hope to all who come in contact with their Alma Mater.